I loved the idea of being a “Bun in the Oven” for my Halloween costume, but, being only 16 weeks along, I didn’t have a very big “bun” yet. Then I bought a cheap Chef’s hat at a local party store, and brought a few baking spoons with me to parties and trick-or-treating. Voila! 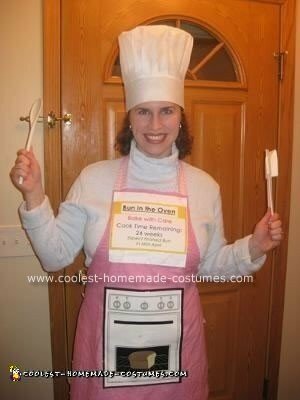 Total Homemade Bun in the Oven Halloween Costume Cost: $2.99 (chef’s hat), $1.98 (color printing). I love your idea and may use it for my first Halloween as a mommy to be! Thanks for the creative idea! Thanks for this idea! My “bun” is not very big yet either since I will be due April 12ish next year. I like how simple and inexpensive this idea is. Thanks for the Great Idea.. I am Due Late April So this Works Great For Me!!! Loveeee this idea!!! I am going to use it.. I have a big bun :) due Dec 8th.. Where did u find that oven I really like yours? Thanks for the great idea! What a great low budget idea. My bin will be here in January so plenty big thanks for the great idea!! I only have 10 weeks remaining “bake time”. This is just perfect! Thanks! I think I just found my costume idea! This is great! And being due in April this works just great! I love your idea because I can wear it (comfortably) to work and I too am not showing much yet. I knew I wanted to do a bun in the oven but I love that you took it a step farther and got an apron, hat and utensils. So cute! Thank you for posting this!! I am definitely going to ‘copy’ your idea! I am going to add Bake at WOMB TEMPERATURE…Hehehe. yes. I love this… where did you get your oven pic? I was getting so tired of searching for costume ideas. Since I am at 28 weeks, I’m having a hard time finding a costume that fits and is comfortable! This costume is perfect for work! Also, It will last through the 2 parties I’m going to this weekend! Thank You for your creativity! I really want to do this too! SO much easier than hauling a big cardboard box around! Can you post a link to the oven pic you used – I can only seem to find the same one super small through Google Images … it gets all pixelly when I blow it up :( Thanks!! I am 32 weeks and also didn’t feel like wearing a cardboard box. Thanks for the great idea! Also, I found the same oven image on a Google search and I copied and pasted it to Microsoft Word. Then you can enlarge and print it there. Hope that helps! Happy Halloween and good luck ladies!